A group of students who had taken a quilting class given by Peggy Hicks organized as the "Quilting Bees" in the spring of 1977. Those present at the first meeting were: Marti Garrison, Peggy Harper, Peggy Hicks, Jeanette LaRose, Judie Montano, Patti Rogers, Jackie Runyan and Merijane Vladyka. The membership quickly grew to over twenty.The Guild participated in the Kingwood Art Show in the summer of 1977 and held its first bazaar that same fall in front of Top Stitch in the Kingwood Shopping Center.One of the group's early projects was the Kingwood Quilt. 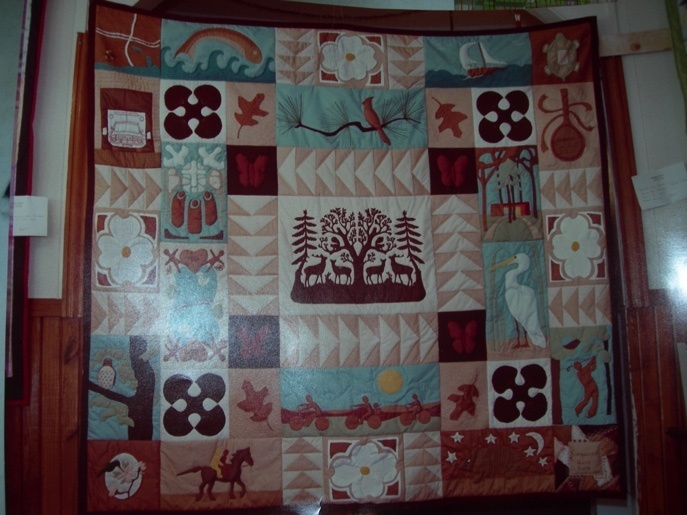 The idea of a quilt, as a celebration of Kingwood, was conceived in February, 1978. The quilt was designed by Merijane Vladyka. Twenty-four members, many beginning quilters at the time, worked on the blocks. The quilt was raffled, raising over $1,800.00 which was donated to KAEMSA. It was won by Ann Davis of Crosby. Exxon eventually bought the quilt from the Davises and gave it - as a corporate Christmas gift - to the King Ranch, their co-developer of Kingwood.During the time of work on the quilt, the name of the organization was changed to Kingwood Quilt Guild. In 1983, with members coming from a wider geographical area, the name became the Kingwood Area Quilt Guild.The Guild has grown to a membership of approximately 200. The Trailblazer Award was instituted in February, 1984; for outstanding leadership and service to the Guild and the art of quilting. The award is given at the discretion of the Board and nominations from the membership may be presented to the Board for consideration. The award is not necessarily an annual award but is appropriately given as our highest award. The Silver Thimble Award is given annually to an individual or individuals within the Kingwood Area Quilt Guild in recognition of their exceptional efforts to promote the art of quilting through outstanding dedication to the skills, knowledge, and personal involvement in guild activities. The recipients are chosen by a vote of the general guild membership. The Golden Needler Award, initiated in 1983, is given to a Kingwood Area Quilt Guild member's spouse who has distinguished himself for his excellent taste, superior judgment, discriminating faculties, and long-standing support of quilting activities. This new award was created in 1999 to recognize members who have already won a Silver Thimble and have continued to offer the Guild years of outstanding service. There can only be two given in any one year; however, the award does not have to be given every year. 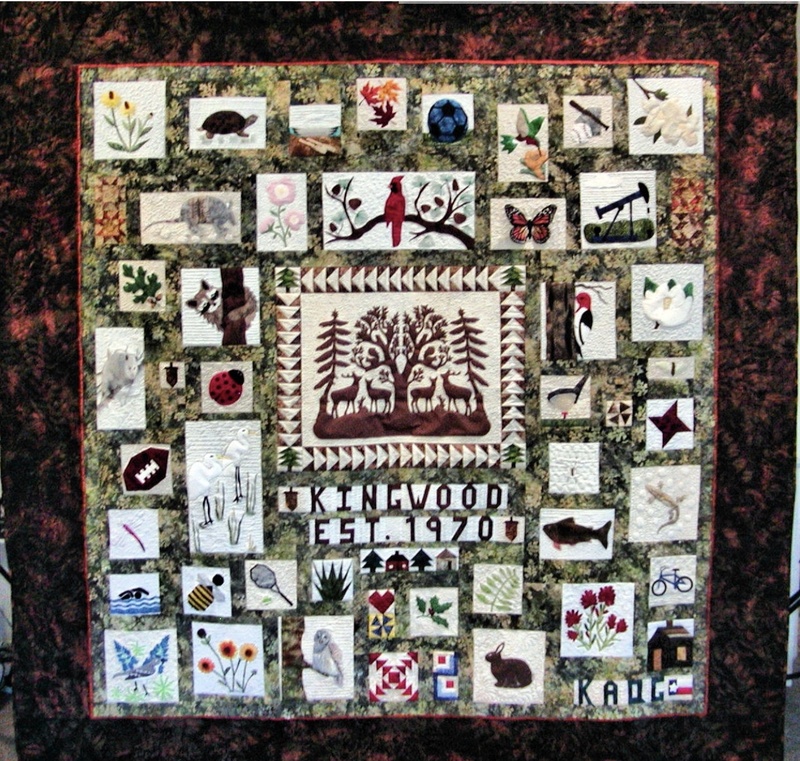 This award was created in 2009 and is given annually to a member or members of the Kingwood Area Quilt Guild in recognition of their exceptional efforts to further the art of quilting through extensive years of dedication to the art; sharing their skills, knowledge and quilts for future generations. Their quilts will be a lasting legacy to the art of quilting. Our new library quilt "ALL ABOUT KINGWOOD" is now hanging on the second floor of the new library. Many hands worked to make pieces, sashings, and assemble this quilt which was then quilted by Margo Pieper. Be sure to check it out on your next visit!! To celebrate the 30th anniversary of Kingwood Area Quilt Guild, a contest was held in the spring of 2007 to select a new banner. The members chose a design by Janet Turini that incorporated many of the elements from the previous banner designed by Judy Curtis. Batik fabric was used to give the banner a bright updated look while maintaining the Ohio Star block, the guild initials. Appliquéd trees in a field of green with blue sky, in the center represent the Kingwood Area. Borders of red flying geese against a light blue background complete the banner. The piece was machine pieced, machine appliquéd and machine quilted by Janet Turini. Our first Quilt Show was held at the Airport Hilton. Publicity for this one day show included the debut of our own "Meadow Muffin," created by Sue Gallion. On national TV a log cabin quilt made at a Guild workshop was raffled. There were more than 200 entries including the Kingwood Quilt, which was on loan from the King Ranch. Spring was the theme of the quilt block contest judged by Catherine Anthony. The winners were: Bev Rogers - first; Phoebe Gregory - second; and Sharen Comstock - third. A quilt made from all the blocks was entered in the south-southwest Quilt show and the Humble Fair and Rodeo. Members decided against having a judged show. Patrons were asked to choose their favorites. Winners of the Peoples' Choice Awards were: Antique Quilt - Josie Clark, New Quilt - Nellie Switzer, Clothing - Donna Farr, and Wallhanging - Bev Rogers. Our congratulations to Co-Chairmen Donna Mikesch and Glennis Nokes for a job well done! We returned to the Airport Hilton, this time for a two-day show, celebrating "Texas Then and Now." Antique quilts discovered at the Quilt Days held throughout East Texas by the Texas Heritage Quilt Society were displayed. Texas was the theme for the quilt block contest, judged by Anita Murphy. Winners were: Arlene Lafosse - first, Nellie Switzer - second, and Dana Zimmerman - third. Members again decided against a judged show and the public picked their favorites. Peoples' Choice winners were: Antique Quilt - Pauline Hines, New Quilt - Josie Clark, Wallhanging - Nellie Switzer. Clothing - Donna Mikesch and Lucille Durham, and Accessories - Joan Van Shuren-Fedson. Mini lectures were a feature of this show with Jane Anderson, Alice Bertling, Melinda Burr. Sue Gallion, Kay Hudec, Arlene Lafosse, Laverne Matthews and Anita Murphy sharing their knowledge and expertise. For Donna, Glennis, and all involved in planning and setting up the show, BRAVO! "A Celebration of Quilts." April 3-5 saw the KAQG show expanded to three days at the Doubletree Hotel. "High Times and Hard Times" was the theme of a special exhibit of quilts from the 1920's and 1930's. More than 150 entries from KAQG members were exhibited. The number of large quilts doubled from the last show. "Our Heritage of Style" fashion show presented quilted clothing from both guest artists and KAQG members. Our first fashion show was a great success and accolades for Nancy Reiter, Charlotte Anthony, and all of our great models were forthcoming from everyone who attended. Mini-lectures were again featured with Harold Hutchinson, Donna Mikesch, Carol Moderi, Alice Schmude and Annelle Sizemore sharing their expertise and experiences. KAQG members took a deep collective breath and decided upon a judged show. Carter Houck, editor of Lady's Circle Patchwork Quilt magazine, lectured on quilts of the 1920's and 1930's and judged 65 quilts and wallhangings. This successful show presented KAQG to our fellow quilters, friends, and neighbors as a creative, exciting group of women working to present quilting to the public as a wonderful art form. Congratulations to Kay Hudec, Arlene Lafosse, and all who helped to make this show a wonderful success! A Celebration of Quilts: "Galaxy of Stars" was held on April 14 and 15 at the Doubletree Hotel. More than 1,000 people attended the show. Our "special exhibits" for this show were quilts from stars of the quilt world and several famous Texans including Lady Bird Johnson and Ann Richards. The show was judged by Virginia Avery, teacher, author and quilt maker extraordinaire. Virginia was the guest speaker at our first Awards Banquet on Friday evening. This event included the husbands and was well received. Once again we held the Luncheon/Fashion Show each day and they were an overwhelming success. The grand finale was a beautiful Bridal Gown with a crazy quilt train. Donna Mikesch and Charlotte Anthony did a fantastic job of coordinating this event. Our wonderful "Heavenly Stars" donation quilt brought in a record 2500 tickets. The Galaxy Gazebo was very popular as was the Market. We held a continuous hands-on workshop to acquaint people with quilting. By having a judged show we hope to have enhanced each member's quilt making. This show was co-chaired by Carole Sydow and Ann James. "A Celebration of Quilts - Through the Years" saw the return to Kingwood of our Guild sponsored Quilt Show. It also celebrated the fifteenth anniversary of the Kingwood Area Quilt Guild. The show was held at the First Presbyterian Church of Kingwood on April 3 and 4, 1992. More than 1,100 people attended the quilt show and bazaar, in which 75 guild members entered more than 230 items in the show. The only judging for the show was done by the viewing public. There were five People's Choice Categories. It was felt that by not having a judged show we would encourage more first-time quilters to participate. Our Special Exhibit was a wonderful display of work done by our Guild Presidents. The Show was a great success thanks to the hard work and commitment of all the guild members. The show was co-chaired by Linda Kay Jones and Jo Knox. "A Celebration of Quilts - The Legacy Continues'' was held at the Humble Civic Center. The show featured our donation quilt "Kingwood Sisters' Choice'' which won a second place ribbon in the Group Quilt Category at the 1994 AIQA Judged Show at the International Quilt Festival in Houston. It was also selected for the 1996 Lang AQS Calendar and featured in the April 1995 issue of Quilter's Newsletter Magazine. It will also appear in a forthcoming book published by Rodale Press. We were very fortunate that the quilt was won by one of our KAQG family, Angela Dominy. With the availability of the "just opened" Humble Civic Center, we were able to utilize 18,000 square feet of space and featured several Special Exhibits, a Tea Room, a Fish Pond and a Silent Auction of Mini-Quilts donated and made by our members. For the first time, we had our very own Guild T-shirts and tote bags for sale. A merchant’s mall with sixteen vendors and a members' boutique of handmade items were also featured. There were over 300 entries from 100 members of the Guild. Five People’s Choice ribbons were awarded in the following categories: Large Quilt - Linda Aspinall; Small Quilt - Jan McFarland; Wallhanging - Carol Sydow; Wearables - Dianna Armentrout; Dolls - Pam Boyle and Heidi Pence. The addition of antiques and decorative items in the booths gave the quilts life and added to the charm of the show. This was the 6th KAQG Quilt Show and it was a great success thanks to the hard work and commitment of the guild members, most especially Show Chairman: Judi Leventhal. “A Celebration of Quilts - The Legacy Continues,” attended by over 1500 people, was again held at the Humble Civic Center. The show featured over 300 entries submitted approximately 60 guild members. Quilts and Wearables were judged by Anita Murphy and Carolyn Howard judged the dolls. Past presidents made awards and selected the item they would most like to take home with them. All items in the show were eligible for five People’s Choice awards which were designed and made by Betsy McCright and Colleen Chappell. The general public selected three quilts, a doll and a wearable. Seventeen vendors filled 25 booths and participated in a new feature, “Tool Time,” where they could demonstrate a product or technique. A very successful guild boutique, “Ima Quilter’s Shoppe” allowed guild members to market their handmade items. Two special exhibits, “Color Fantasy” by Judy Dales and “Quilted Sea Tapestries” by Ginny Eckley highlighted two local artists. Our KAQG booth displayed charity, education & workshop projects, sold tote bags & T-shirts and informed visitors of our many activities. The mini-quilt silent auction sold 49 quilts over the two-day event. Our raffle quilt “Stars and Scraps Forever” was won by a Kingwood resident. The lobby was dedicated to our guild’s 20th anniversary and displayed material from past shows. At the entrance to the show hung our “Stained Glass Stars” which was the IQA raffle quilt for 1997. Vignettes embellished each quilt booth as well as a garden display for Wearables. The show was chaired by Carol Birsa, Jan McFarland and Margaret Rose Roberto. "Ties That Bind" was the theme for KAQG's eighth quilt show. Mary Taylor's vignettes in each booth displaying quilts were tied together with men's neckties and the Best Interpretation of Theme award inspired 22 submissions ranging from tie-themed quilts to memory quilts of family ties. The judged portion of the show was divided between quilts and wearables, judged by Kim de Coste of IQA, and dolls, judged once again by Carolyn Howard. Those submitting judged entries were invited to an early morning announcement and preview party. Special exhibit themes were children's quilts, tessellated quilts, holiday themed quilts and our first exhibit of challenge quilts. Lori Basgil worked for two years to bring the Keepsake Quilting Exhibit to our show for the first time. It was extremely well received and enjoyed by all. Judy B. Dales also brought another first to KAQG with a Professional Invitational exhibit of work by professional quilters. The success of last show's vendor mall and tool time feature along with the members’ boutique, “Ima Quilter's Shoppe" (with a recently face-lifted Ima sitting at the entrance) was repeated. New KAQG t-shirts and tote bags were found at the KAQG booth, which boasted an historical exhibit done by Rose Burnett highlighting the guild's many activities. Our donation quilt was won by a delighted resident of Atascocita. And People's Choice awards were announced in the lobby at show's end along with refreshments. The show was chaired by Sara Avers, Carol Birsa, Jan McFarland and Margaret Rose Roberto. The theme for KAQG's ninth show was "A Garden of Quilts." This themewas evident throughout the show, from the flower filled lobby decorated by Connie Richman, through the vignettes in each booth designed by Mary Taylor and Noreen Borys, and through the garden path leading to the Members Boutique, overseen by Linda Aspinall. Members submitted over 325 entries for this year’s show, necessitating our expansion into the Special Events Room of the Humble Civic Center, giving us over 3000 more square feet of space. We expanded the vendor mall by several spots and had quite a few vendors who had never been at our show before. The judged portion of the show was judged by Hazel Canny, who judged both quilts and wearables. Once again, members submitting judged entries were invited to an early morning announcement and preview party. Winners were allowed to pin their ribbons on the winning quilts themselves. The Keepsake Quilting Exhibit was once again featured at our show, and Jackie Theriot put together an old and new Redwork exhibit detailing the history of Redwork. The KAQG Booth sold t-shirts and pins and signed up an unprecedented 14 new members at the show. Our beautiful hand-appliqued donation quilt "Friendship in Bloom" was won by a resident of Montgomery, Texas, who entered the drawing one Saturday when she stopped in at the Needle Nest to buy thread. The show was chaired by Sara Avers and Lori Basgil. The theme for KAQG’s tenth show was “Quilts: The Fabric of Texas… Today.” The theme was clearly evident by Texan items such as a saddle, windmill and wildflowers in the lobby. The booths, decorated by a team led by Susan Spindle, elaborated on the theme with Texan town names and items reflecting our Texas and Spanish heritage. Our Boutique, overseen by Linda Aspinall, was a big hit again this year. Libby Lehman, a native Houstonian, judged the quilts and wearables. Members submitting judged entries were invited to an early morning announcement and preview party hosted by Sue Creaney, who provided coffee and donuts. Winners were allowed to pin the ribbons on their winning quilts. The Special Events exhibit, chaired by Judi Leventhal, depicted the legacy of quilting in our guild. Members were asked to share their legacy of quilting with samples of work from previous generations of quilters. The KAQG Booth sold t-shirts, guild pins and cookbooks and encouraged visitors to join our guild. We also had a mini quilt silent auction and a block contest. Our donation quilt, “Spring Comes to Texas,” was a joint effort by many talented quilters in the guild, and included the beautiful quilting done by Linda Aspinall. The quilt was won by Donna Greenwood, mother of member Edna Taylor. The take-down on Saturday took less than an hour and the quilts were distributed in about the same amount of time. The show was chaired by Margie Freeman and Sandra Ingram, with grateful thanks for her advice and encouragement to their assistant, Sara Avers. The KAQG’s eleventh Quilt Show, “Southern Comforts, Northern Lights,” was held April 22 and 23 at the Humble Civic Center. Show attendance was nearly 1,400 people. The glorious colors of the Northern Lights and stars were in abundance throughout the show, starting in the lobby with Ima sitting amidst her quilts, fabrics and books and through to the wonderful vignettes displaying our members’ quilts. The special exhibits area featured some quilt blocks and completed quilts from some of our former Presidents. It also included our dolls exhibit. Our Tea Room and Fish Pond were very busy again this year. Our ever-popular guild boutique allowed guild members to market many handmade items. Our mini quilt auction was another favorite this year. We had over 250 quilts entered in the show and of those 137 quilts were submitted for judging. Our quilt show judge was Marcia Kaylakie, a quilter, teacher, judge, and appraiser from Austin, Texas. Marcia also appraised quilts for members and visitors. We had the donation quilt, “Southern Comforts, Northern Lights,” appraised by Marcia. The quilt was won by a resident of Onalaska, Texas, who rushed back to the Civic Center to pick up her quilt. The show was a great success with the help of our wonderful volunteers. The show was co-chaired by Sandra Ingram and Edy Etter. The Humble Civic Center was again the site of KAQG’s twelfth biennial Quilt Show “Follow Your Own Star” held on April 13 and 14. Close to 1,200 people attended the show. This was a special time for us since this year we celebrated the Guild’s 30th Anniversary. As always this show was our way of showcasing the tremendous talent that our members possess. We had close to 200 quilts entered in the show of which 102 of those quilts were submitted for judging. Our quilt show judge was Liz Axford, an artist and quilt maker from Houston. In the past, Liz has judged the 1999 and 2003 IQA quilt shows and 2005 Celebrate Spring quilt show among others. We had our enormously popular Out of this World Boutique, the Shooting Stars Silent Auction for mini quilts, grab bags from our Star Fish Pond and, new this year, the Galaxy Booth where visitors could learn about quilting. We also had a Trip around the World exhibit displaying blocks from, where else, around the world. The theme of our Special Exhibit area was Mommy and Me or Grandma and Me quilts and also featured Holding on to Memories Scrapbook quilts. Our donation quilt “Stars in my Garden” was inspired by Judy Martin’s original design found in her book “Judy Martin’s Stars and Sets”. Judy granted permission to the Guild for the use of the pattern. The quilt was won by Karen Mosier of Kingwood, Texas. Our wonderful members volunteered their time to ensure that our show would be a great success. The show was co-chaired by Edy Etter, Lish Croes, Janet Turini and Nancy Wakefield. The 13th biennial was held at the Humble Civic Center on May 1 and 2. The quilt show was "Peacemakers of the Heart". We had a judged show with over 300 quilts. The special exhibit was quilts that touched someone heart. Vicki Pignatelli quilt for her husband was displayed. The quilts really touched the hearts of the attendees. Every emotion was displayed in these wonderful works of art. The 14th show was held at the Humble Civic Center on April 19 and 20th. The theme was "The Quilted Forest". The donation quilt is pictured here and the show winners are listed here.